Saving the world isn't just an adventure – it's a job! 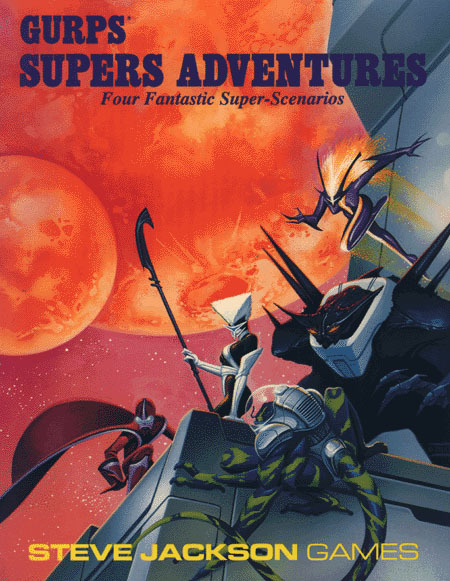 GURPS Supers Adventures is a mind-boggling ride from the depths of the oceans to the far corners of the galaxy. In Jupiter Blues, the heroes must quell a rebellion on Jupiter's turbulent moon, Io. Can they handle the mind-controlled Raveners, or will they end up buried in a cold, dark mine shaft? Mark of the Kraken, a two-part adventure, sends the costumed crusaders into the ocean at the behest of the U.N. Can they stop the watery menaces in time, or will the Green Dawn eco-terrorists use the deadly Kraken to drive mankind from the oceans forever? Finally, Web of the Zyrani takes the supers on a surprise cross-galactic trip to find a missing team of scientists. After visiting the high-energy planet of Zyrane, they'll never by quite the same again . . . Although set in the world of GURPS International Super Teams, these adventures can work in any campaign world for any team of heroes. Guidelines are given to help the Game Master increase – or decrease – the dangers facing the team, allowing each scenario to be perfectly tailored to the campaign. Each adventure includes all necessary maps and diagrams, and can be completed in one or two long game sessions.